Toyed with the idea of sleeping in the park and I was obviously looking the part of a lost runaway. A kindly market stall-holder gave me some fruit and an American couple gave me their guide book as they were leaving that day; Europe on $10 a day. I was planning to get by on £1 a day and was surviving quite comfortably until I hit Scandinavia. Overnight to Copenhagen. For some strange reason I failed to find the mermaid on my first trip. Still, the harbour was fun and there were plenty of free museums. However, like most of Scandinavia, not a good place for a budget traveller! Incredible to think that over thirty years later I would end up living here, married to a Norwegian. Also incredible how it changed in the meantime, funded by their new found oil wealth. The Frogner Park, also known as the VIgeland sculpture park, is just as fascinating today as it was then. Survived on milk and crispbread. Destination chosen entirely on basis of where my ticket would take me for free overnight. Of course when I got there my choice of subsequent destination was somewhat limited; either go back the way I had just come or continue North. 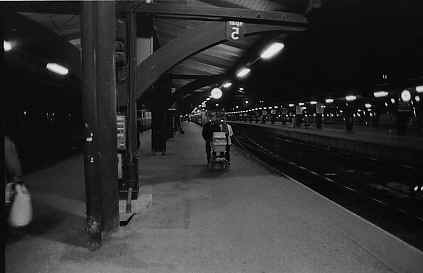 A desolate railway station on the main line North. Searched by bemused but polite Swedish customs officers who could not understand why I was carrying a 5 litre water bottle; with hindsight neither can I! Moral of the story is that, if you have the time, it is always worth going to see for yourself. Of course, nowadays you can just go onto the web and find out for yourself or ask someone else. After all this time I don't really remember much of Helsinki other than the sparkling sea and the Modern Art Gallery. Decided I wanted to see more of the rest of Finland so chose a night train inland. At the time it seemed quite exciting, spending the night on a train which split half way to either Joensuu or Leningrad (as it was still at he time); passing within a few miles of the Evil Empire...how things change! Arrived with just enough time for a wander round the uninspiring town, then back on the train to spend a day admiring the scenery...more trees. Arrived in the evening and for some strange reason decided to go all the way round the Baltic rather than crossing to Stockholm by ferry; probably the idea of using my ticket to the limit! Only went there because it was the furthest North my ticket would take me; had no idea how beautiful it would be. Rumour had it that if you turned up on the late train and wandered aimlessly around the streets, the police would put you up in their cells and give you breakfast in the morning. Unfortunately they had got wise to this and shepherded us all, straight off the train, to the outrageously expensive youth hostel. Turned up for the afternoon train only to find they had switched to the winter timetable so was forced to spend another night at the hostel. Could not believe how expensive the food was...resorted to nuts and raisins emergency supply. I recall finding a sleeping compartment with some Israeli students. The guard was too bored to throw us out so we enjoyed the comfort of bunks for most of the night before being unceremoniously ejected by a less tolerant conductor the following day. The trees were getting very boring and we were starting to tire of emergency rations, so decided to get some food and blew a week's budget on meat and two veg in the buffet. Still with the students we hit the National Museum and the "all you can eat" buffet including beer. They tried to tell us that we were only allowed one drink each, but by then it was too late. I remember feeling very ill and never made it to the incredible Folk Museum until many years later.